Before heading out to Italy there was pretty much only one thing on my list that I just had to do whilst I was there (other than get a bit of colour). Monday morning in Italy had another little road trip in store for us as we jumped in our little 500 and head back north to Pompei. Having learned about the Romans, the ancient city of Pompei and Mount Vesuvius at a young age, I couldn’t pass up an opportunity to visit the Scavi di Pompei site whilst we were close by. I can remember being mesmerised by the story of the ancient city in Primary School as we were taught how what the Romans thought was just an average mountain, erupted, taking them by surprise and devestated the whole area. The drive from our hotel to the ancient ruins only took around 45 minutes and we arrived shortly before 10.30am having left the hotel straight after breakfast. We found sheltered parking extremely close to the archeological site where the charge was just €3 per hour and there was a shop & Pizzeria attached as well which was handy for picking up a much needed bottle of water from before we headed in. We also purchased a guide book and map (Tour Guides will try to sell you their services at the gates for €100 for 2 hours, the book was €8.50) and decided that we would head in and do the 4 hour route, taking in as much as we could before it got too hot. Entry to the dig site is just €13, which personally I think is fantastic value (I also think that if such a place was in the UK we would probably get charge double for entry) and once inside you can just wander around at your own pace, taking in the amazing architecture of their amphitheatres, the unforgettable preservation of the people of Pompei and the artefacts that have been recovered over the years. DO take a bottle with you as there are taps inside for you to top up from and stay hydrated, it’s very arid inside thanks to the dust so you will need to drink plenty. DO make sure you wear sensible, comfortable footwear – the Romans weren’t (and still aren’t I must add) renowned for their beautifully smooth roads so be prepared for plenty of uneven surfaces! DON’T wear anything you don’t mind getting dirty, the volcanic dust will leave your feet blackened after a few hours! DO get in early doors – as you can imagine how he site is very open with little shade, so if you visit in high summer try to get there in the morning before the midday sun takes hold. Although we had the full intention of following the set route, once in there we just started wandering around, seeing what we could find and pretty much just using the map as reference guide instead and it was very good to have to make sure we saw everything that we wanted to. We manage to last around 3 hours before the heat started to take it’s toll and we started to hear the call of nice refreshing pool beckoning us back to our hotel. So after picking up a few souvenirs we headed back to the hotel in desperate need of a cold shower to freshen up and lunch. Another little tip, if you decide to drive in Italy as we did, make sure you have plenty of €2 coins as you will need them for the tolls and the sat nav seems to take you an extra junction every journey so you have to pay an extra €2. That afternoon we enjoyed a few hours relaxing in the sun and chilling out in the hotel pool after a light lunch at the poolside bar. The pool at the hotel was situated atop the main building and boasted views of the Tyrrhenian Sea and Mount Vesuvius and was perfectly laid out so that you could sunbathe from sunrise to sunset should your heart desire. 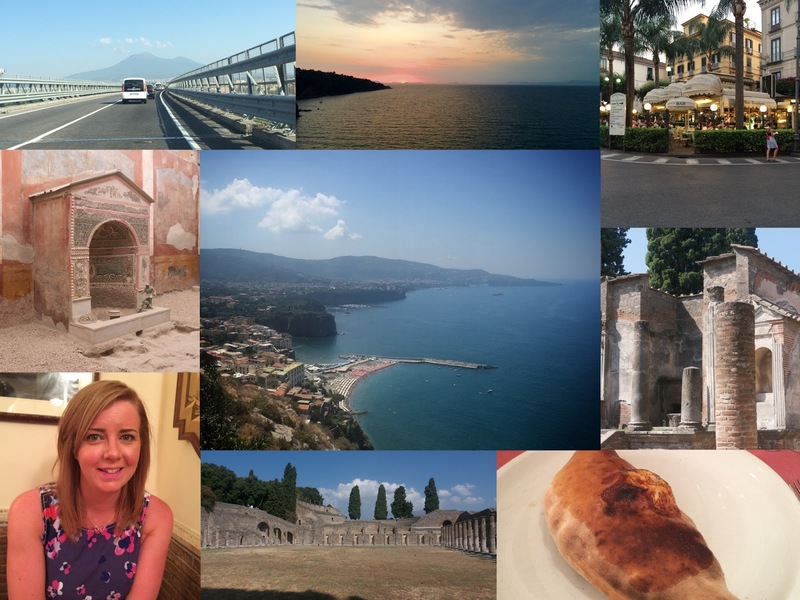 That night we decided to jump on the shuttle bus and head back into wonderful Sorrento itself in search of Pizza. We managed to arrive in Villa Comunale (the large public gardens atop the cliff behind the Saint Francis Cloister, with the most amazing panoramic views of the Bay of Naples) just in time for sunset and it was worth the dash from the drop off point to see the sun disappear in a blaze of glory. After watching the world go by for a little while, we headed back into the centre of town and found ourselves at Pizzeria Aurora in at the far left of Piazza Tasso. Managing to get a table inside and taking full advantage of the air conditioning on offer, Paul opted for one of his favourites, a Calzone pizza. The Napoli Calzone was oozing cottage cheese and filled to the brim with ham, herbs and tomatoes whilst I chose a simple Ham & Asparagus pizza. I’m not sure how we Brits can get something as simple as a pizza wrong but we do. Italian bases are light and crispy, their toppings are not overloaded or over processed and fresh & tasty… They are just wonderful creations to enjoy. One thing I learnt was that the concept of a single glass of wine seems lost on the waiters and bar tenders and on this occasion I was served up a small bottle in a clear plastic bottle bag filled with ice, an idea I love and may have to adopt!